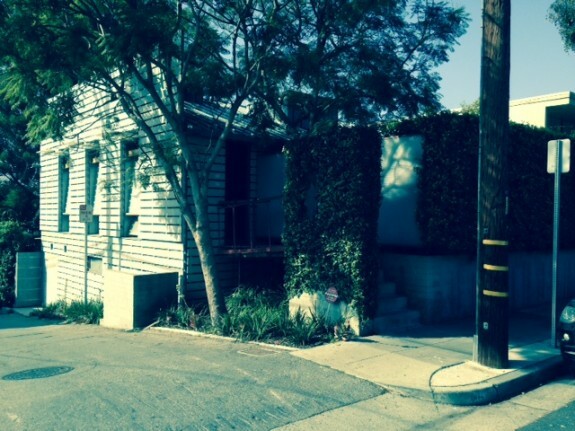 Preservationists and Ray Bradbury fans were shocked when the late author’s former home in Cheviot Hills was suddenly torn down. And design buffs were bemused when the perpetrators turned out to be architect Thom Mayne and his wife Blythe Alison-Mayne. But it turns out they have plans for the site that might have piqued the late futurist’s interest. Thom Mayne is principal of the architectural firm Morphosis, and since the founding of the office in 1972 he has created buildings that challenge our assumptions about architecture (an early Morphosis project, the Angeli Caffe for Good Food host Evan Kleiman, featured a beam pushing through the facade). 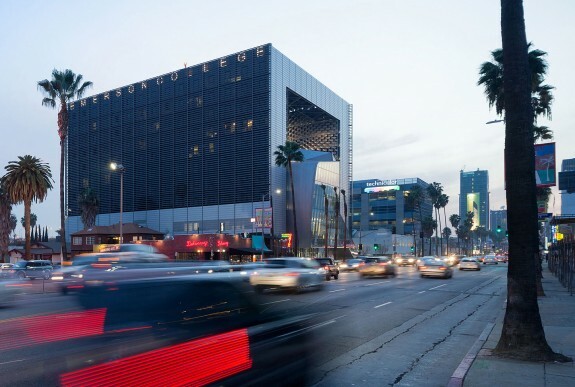 The Caltrans building in downtown and his newly complete Emerson College in Hollywood are among a portfolio of work that relishes experimentation with materials and technology for their “performative” as well as extreme aesthetic possibilities, and has earned him the prestigious Pritzker Prize. But while Thom’s buildings might come across as thrusting, hard-edged, techno-fantasies worthy of a Sci-Fi novel, his domestic life is a model of intimacy and simplicity. He and his wife and business partner Blythe Alison-Mayne and their two sons have lived for some 30 years in a 1600 square feet house in Ocean Park in Santa Monica. With their sons grown and the firm’s office now in Culver City, Blythe wanted to live east of the 405, but still in a lush garden site. Her realtor found her the perfect spot, in Cheviot Hills. But that property turned out to be the former home of the author Ray Bradbury, the beloved writer of Fahrenheit 451, The Martian Chronicles and numerous other books, who lived in a “little yellow house” in Cheviot Hills for some 50 years. Unimpressed by the house itself — it was “unusually banal,” says Thom — the Maynes went ahead and drew up plans for a replacement, which included preserving the author’s memory with a wall featuring the names of all the books by Bradbury. Read on below for a conversation with Thom and Blythe about their response to the furor at the destruction of the house, as well as what they plan to build on the site. 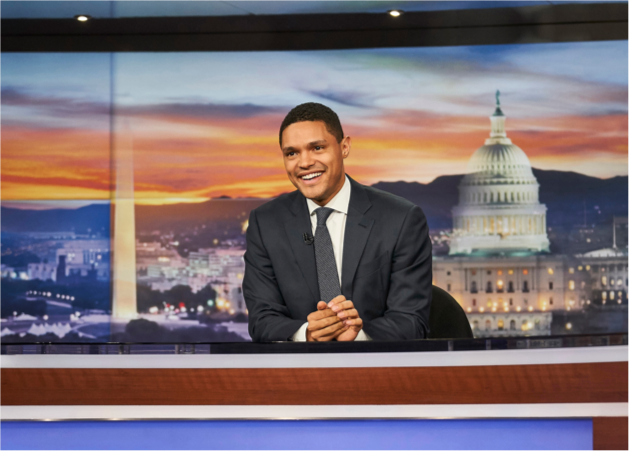 Or listen to the dialogue in the audio above, complete with commentary from Ken Bernstein, Manager of the Office of Historic Resources, and Jonathan Eller, Director of the Center for Ray Bradbury Studies. 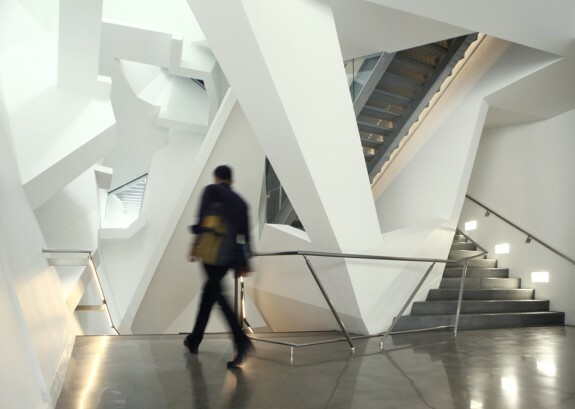 We’ll talk about Morphosis’ Emerson College in the context of a look at “skins” in architecture on an upcoming DnA. DnA: When you discovered the property had been lived in by Ray Bradbury what did you think? Blythe Alison-Mayne: When they said that it had been Ray Bradbury’s house and that he had died there, I thought that was interesting little factoid, but it didn’t really mean a whole lot to me except for the fact that he lived there. But it was such a bad house, really one of the worst in the neighborhood. Thom Mayne: I could make no connection between the extraordinary nature of the writer and the incredible un-extraordinariness of the house. It was not just unextraordinary, but unusually banal. BM: And then we proceeded with our plans. We’ve been designing it for six months and so we got our permit to demolish it which is what we did although we didn’t actually demolish it we used something else called deconstruction which approximately doubles of the price of demolition but it saves everything worth saving in the house. All the original wood and all the interior wood finishes and cabinets are all being recycled and sold by the company who is doing the deconstruction. DnA: Are you going to incorporate any of these materials into the house? BM: No, nothing, although we are going to make reference to him in the house. There is a wall that we will design that will be seen from the outside of the house and all of the titles of his books will be embedded in this wall. DnA: Who actually sold the house? Was it family members and if so did they stipulate that the house should be preserved? BM: It was the family and they were very, very much not involved and there was no expectation of preservation, absolutely nothing. TM: And then after that the whole conversation of the domestic environment for our family was very much about our family. I wish Ray was alive now, we could chat about it because he had an interest in architecture. DnA: What are you planning to build? On the blogosphere one of the terms that’s being thrown around is McMansion. BM: That is so, so wrong. It’s the exact opposite of a McMansion. We are building this really, really modest house. Most of it is landscaping. It’s really interesting because the ground is being excavated and the house is going down below the level of the ground, a lot of it, not all of it. We come up only four feet from the ground level. TM: If you look at the maximum envelope which everybody’s building, we are we are building only 20 percent of the volume that we are allowed to build so it’s actually an anti, a super-anti-McMansion. We are attacking that issue because I see this very much as a prototype for a California house. I’m aware of the Case Study program; I studied with Pierre Koenig and I see this as the next generation of a Case Study for a residential environment in California and it has do with scale, it it has to do with landscape, it has no air conditioning, it has to do with climate, it has to do with lifestyle. The main room is exterior, it’s an outside room and we’ve learned that because that’s how we live in our house currently. BM: There is one awesome design detail and that would be that our bathroom on the second floor is in a garden in which there is a full-grown tree coming out of the second floor of the house; and under that tree is where the shower and the bath tub are, but they are outdoors. DnA: People might see Blythe in the shower? BM: No, but they might see Thom. I’m a little more shy. DnA: It is interesting because generally I think there’s a reading of your buildings as being large in idea and large in scale. But when it comes to your domestic environments you go small, you go the other direction. TM: We now look at our little Sixth Street house as something that’s so much embedded in our family and its intimacy definitely had to do with our family and how we behave. We sit at that (dining) table and it’s everything. It’s homework, it’s social, it’s eating, it’s hanging out, and there’s no furniture in the room. We sit at that table and then behind it is the bathroom and the cube and that’s it. You can ask our boys and they would have the same idea that we had a kind of a particular environment that you don’t find in this particular time, given the marketplace and the notion of what people want in architecture: big, big, big luxury, all this kind of stuff when what they grew up with is incredibly simple. DnA: How would you feel if your home your home on 6th Street was to be bought by somebody who then tore it down? Do you feel that your home should be preserved as part of L.A.’s architectural history? BM: I think I understand why people might think it should, but I don’t personally feel that way. TM: I’m not sentimental at that level at all. The house has always been about my family, it’s not Capital A architecture at all.